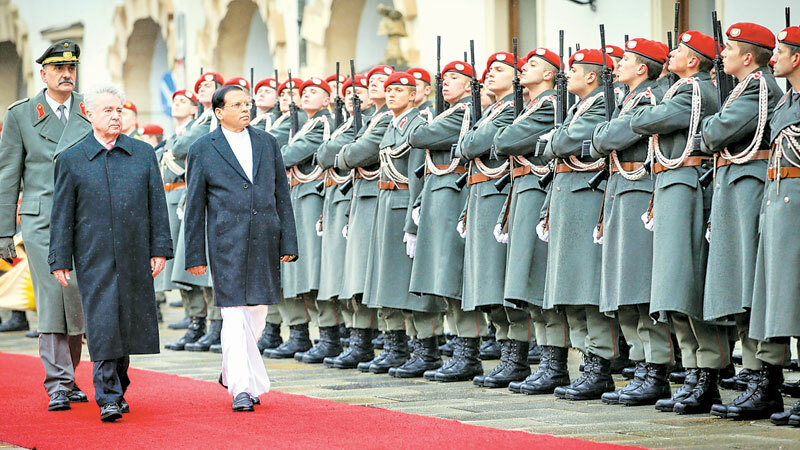 President Maithripala Sirisena arrived at the Vienna International Airport, yesterday for a two-day State visit to Austria. Ambassador Dr. Bettina Kirnbauer, Chief of Protocol of Federal Ministry for Europe, Integration and Foreign Affairs of Austria warmly welcomed the President at the Airport upon arrival. When the President and the delegation arrived at Hotel Kepmpinski in Vienna, they were received by Ambassador of Sri Lanka to Austria Priyani Wijesekara along with the Embassy staff. President Sirisena held talks with the Federal President of Austria, Heinz Fischer at the Hofburg Presidential Palace. Thereafter, the President is scheduled to visit the Austrian Chamber of Commerce. He will also meet the Sri Lankan community well-wishers. President Sirisena's state visit to Austria will provide a new dynamism to the bilateral engagement, building upon the excellent relations which exist between the two countries.